The entries in the report beneath the controls can be collapsed and expanded using the plus and minus icons. Lastly, clicking the Excel icon exports the report to Excel, and the Print icon prints the currently displayed report. How do I change the columns Grouped by? 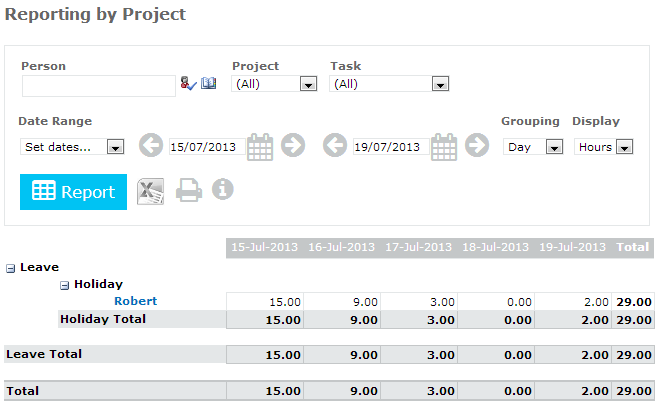 NOTE - Instead of changing one of the existing reports you may want to create your own custom report. The change a report's grouping for all users, select Edit Web Part from the Reporting web part menu (the second web part on the page, when the page is in Edit mode). 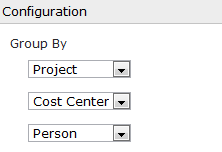 Simply change these to the columns you wish to group on (including Custom columns). The order of the columns in the configuration is the order they will be used to group the data. If you should report on all data, or only data from Approved Timesheets. Click Ok to update the web part and see your changes.